A specimen found in the Atacama Desert over ten years ago rocked the internet with many wild theories about its origins and how such a creature came to be on Earth. These remains were skeletal and had a mostly humanoid form. However, it was also only about six inches long and had an elongated skull with an abnormal ridge. Its eye sockets were also stretched out of normal human proportions. For some, this was enough evidence to count it as an alien that had somehow come to Earth and perished here. However, it seems a scientific study of the tiny skeleton has ruined that fun. The researchers took minute samples of the skeleton’s matter and conducted a whole-genome study. The results indicated that the skeleton had a much more plausible origin: it was a human foetus that probably never came to term. This was due to a panel of specific mutations that caused possibly fatal bone disorder. The Atacama skeleton, or ‘Ata’, as it also came to be known, was found in the Atacama Desert over 10 years ago. This Chilean discovery became famous online, particularly among those who cited its unusual length and appearance as evidence that it was not human. Alternatively, Ata may have been a non-human primate preserved in an unusual way with horrible malformations for some reason. However, scientists also became interested in Ata, seeing the possibility of mutation as an alternative explanation for its looks. A team of geneticists, led by Garry Nolan of the Baxter Laboratory for Stem Cell Biology at Stanford University and Atul Butte from the Institute for Computational Health Sciences at the University of California (San Francisco), analysed the skeleton for its remaining genetic material. The scientists were able to confirm that Ata’s genome was that of a human female. Furthermore, this genome was associated with Chilean ancestry, and also with the modern age. These findings contradicted previous claims that the skeleton was an ancient artefact that may have reached the Atacama region from elsewhere. More interestingly, the skeleton was found to have a ‘bone age’ of between six and eight years. However, the length of the skeleton forced the conclusion that it was most likely those of a foetus. But how could a foetus’ bones correspond to such an advanced age? The scientists conducted a genome-wide study in order to find the answer. They found that Ata had had mutations in seven specific genes: ATR; COL1A1; COL2A1; FLNB; KMT2D; PCNT, and TRIP11. These genes have been associated with dysplasias (or abnormal growth) of the bones in previous studies.Mutations in those genes were associated with a range of bone abnormalities, many of which corresponded to Ata’s appearance, in the Human Phenotype Ontology database (HPO). These included reduced body length; missing pairs of ribs; an elongated skull; accelerated joint fusion and full-skeleton dysplasia, all of which Ata exhibited. This suggests that Ata may be the skeleton of a foetus whose bone-related mutations prevented it from developing properly or surviving to term. Alternatively, Ata could be a child whose genetic disorder resulted in accelerated bone aging and premature death. The mutations in Ata’s genome were found to be related to a total of 64 single-nucleotide variations, some of which occurred in the seven genes that affected the skeleton’s growth and development. They resulted in conditions that have been previously observed in humans. For example, mutations in KMT2D are known to be associated with skull malformations, growth restriction and skeletal abnormalities. FLNB generally determines normal foetal skeletal development, whereas COL1A1 and COL2A1 code for important bone and cartilage components. Accordingly, mutations in these genes can degrade bones and joints. Therefore, Ata represents evidence that mutations in a combination of these genes simultaneously can result in some extremely striking defects – however, the specimen will still be human, without the need for extravagant claims to the contrary. 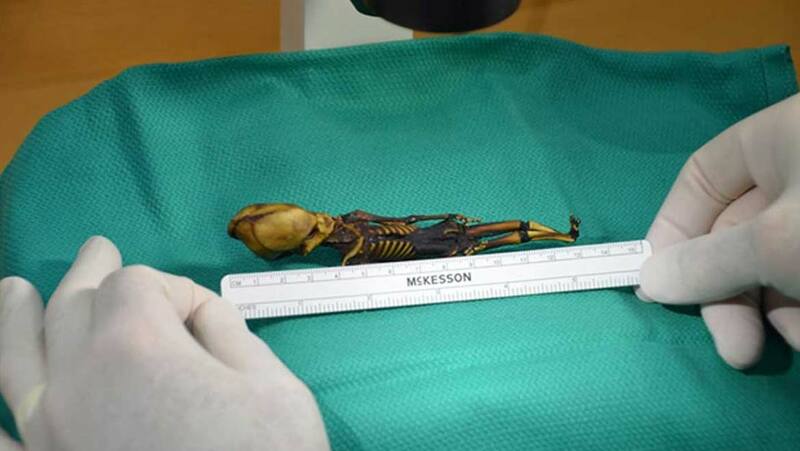 Therefore, it is most likely that this unusual specimen found in Chile is the result of many unlikely variations in several genes happening at once, rather than anything involving extra-terrestrial origins. The mutations found in Ata’s genome, some of which are novel, may also help us improve our current understanding of bone dysplasias. Butte and Nolan also hope that their science could lead to better treatments and options for people affected by these disorders of skeletal growth in the future. In the meantime, the discussion over Ata’s real origins can finally be laid to rest. Bhattacharya S, Li J, Sockell A, Kan MJ, Bava FA, Chen S-C, et al. Whole-genome sequencing of Atacama skeleton shows novel mutations linked with dysplasia. Genome Research. 2018. Kohler S, Doelken SC, Mungall CJ, Bauer S, Firth HV, Bailleul-Forestier I, et al. The Human Phenotype Ontology project: linking molecular biology and disease through phenotype data. Nucleic Acids Res. 2014;42(Database issue):D966-74.